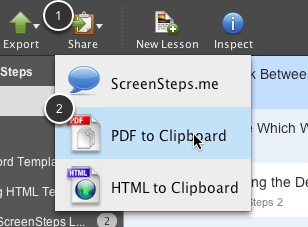 With ScreenSteps you can quickly copy the path to a PDF version of a lesson to the system clipboard. You can then paste the file path into any system file dialog or application that supports file paths. This feature is useful for uploading lessons using a browser or attaching lessons to emails created by applications that don't support the HTML format on the system clipboard. If you have a lesson open or you have a lesson selected in the lesson library list you can click on the Share icon in the toolbar (1). Select PDF to Clipboard in the menu that appears (2). A PDF file will be created in a temporary folder on your computer. The path to the file will be placed on the system clipboard. 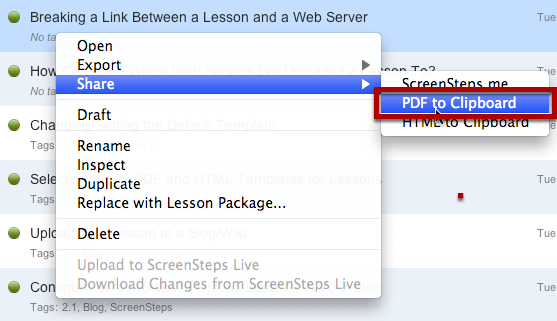 You can also right-click on a lesson in any list and select the Share > PDF to Clipboard option. Next: How do I Specify Which Template Is Used When Exporting To Clipboard?